The Starlight is one of Replogle's most popular world globe styles in the 1940's and 1950's with today's cartography. A beautiful satin chrome painted base with Gyro-matic mounting complement the striking black ocean design. 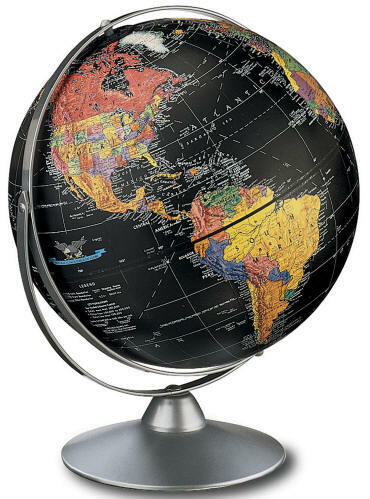 Vibrant pop art colors distinguish boundaries on the 12" raised relief globe ball. * Raised Relief - to better emphasize the mountainous areas of the world - there are ‘bumps’ on some areas of the globe. They are called raised relief. They are there so that you can ‘SEE & FEEL’ the mountains - although their actual height on the globe does not have any relationship to the true relative heights of the mountain ranges.